Slings Ahoy! | Separated by a common language. Hazaa! I knew ebay would treat me right! I found a lady who sells homemade pet slings on ebay for only $9 Canadian! 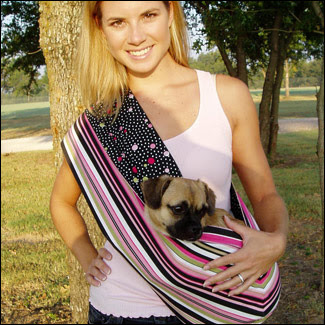 They’re basically a baby sling, but still work as a pet sling! This lady’s slings are the nicest patterns I’ve seen. There are a few other women selling them on ebay, but they’re pretty heinous patterns! Check out the nifty slings Here! Maybe she’s engaged to the dog? Yeah, I cant imagine hualing around my almost 30 lb Alfred in one of those slings!